Every year, health fads come and go, sometimes returning regularly for a brief 15 minutes of fame. Charcoal toothpaste is one of them! But is charcoal toothpaste safe, and can it actually whiten your teeth? Read on to learn the facts about charcoal toothpaste and your oral health. Activated charcoal has been a popular health and beauty fad for several years, used in everything from body scrubs to drinks. Its claim to fame is its highly porous and absorbent quality – purported to sap away toxins and bacteria from your body. These materials are processed in extreme heat to create a large surface that’s full of pores. This is different from the charcoal you may know, like charcoal used with a grill. However, you may still be likely to reconsider now that you know what goes into making it! Whitening qualities – It’s claimed that charcoal toothpaste can naturally absorb bacteria or stains from your teeth, leaving them whitened. 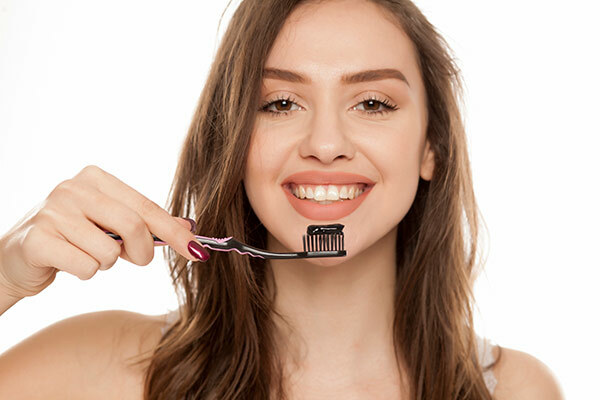 Remineralization – Charcoal toothpaste is believed to be another way to enhance the natural remineralization of teeth, similar to fluoride in water or toothpastes. Cleans Teeth – Similarly to its whitening qualities, some believe that charcoal toothpaste’s absorbent qualities improve its ability to clean your teeth versus other types of toothpaste. According to the American Dental Association, there have been no studies which have proven any of these qualities in activated charcoal toothpaste. Despite a growing number of articles promoting the benefits of charcoal toothpaste, none have substantiated the claims. Are There Risks Associated with Charcoal Toothpaste? Yes. While the benefits of activated charcoal toothpaste are not yet proven, there are legitimate risks when brushing with it. Primarily, activated charcoal is abrasive. Like anything abrasive, it has the potential to do permanent harm to your teeth. Extended use of abrasive toothpaste like charcoal will remove enamel from your teeth. This enamel is a natural shield, protecting you from bacteria and exposure to extreme temperatures. As your enamel is worn away, it is lost forever. There is significant research into techniques for restoring lost enamel, but currently, none have been scientifically proven. Once your enamel is gone, your teeth become even more vulnerable to bacteria and decay. You will also begin to suffer noticeable symptoms of enamel loss, such as increased sensitivity to hot or cold temperatures. You’ll develop cavities more easily, and any lapse in your daily oral care will be exponentially more damaging to your long-term oral health! The bottom line: the benefits of charcoal toothpaste aren’t proven, but the risks are. There are better options out there for your teeth! The absolute best way to whiten your teeth is at the dentist! Solutions like Zoom Whitening have major benefits over home remedies or over-the-counter strips. The biggest benefit is that it’s done under the supervision of an expert! Through in-office whitening, you can achieve a smile up to eight shades lighter in just an hour’s worth of treatments. Compared to the minor results from weeks or months of home solutions, it’s a great option for anyone that’s reserved about their pearly whites. Learn about our top five recommended ways to whiten your teeth. Want to know more about teeth whitening methods and find out the best one for you? The professionals at Walbridge Dental have the answers. From routine cleaning and exams to advanced restorative treatments, we offer complete family dental care to families in the Millbury community. Contact us online to set up an appointment now or call us at 419-836-1033. This entry was posted in Dental Tips, Preventative Dental Care and tagged tooth cleaning, toothpaste. Bookmark the permalink. Follow any comments here with the RSS feed for this post. Both comments and trackbacks are currently closed.